I am always on the hunt for the perfect mascara… I am not gifted with the world’s longest eyelashes and thus I am always searching for a mascara that lengthens, separates and thickens my eyelashes and pumps up the volume as an extra bonus. As I don’t use false eyelashes, I seek refuge in a mascara that ticks most of the boxes. I know… sometimes I ask for the impossible ! 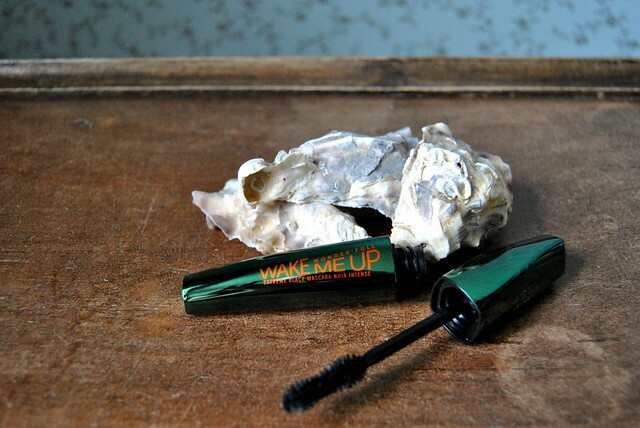 I am currenty using Rimmel ‘wake me up’ mascara and I must say that I am really satisfied with the result! I like the brush for a start. It separates my eyelashes and I can get to all my lashes… even the teeny tiny ones. With this brush you can work really neatly. When getting the brush out of the tube, it isn’t drenched in mascara, so you can put on the mascara clump-free which is definitely a big plus. And did you know this mascara smells like cucumber? I know! Weird isn’t it… but nice! I’ve never ever had a mascara that smelled like something… they just smelled like… well… mascara I guess! But this one smells really fresh. I hadn’t noticed it at first… but I read about it in a magazine and now I smell it whenever I open it 🙂 ! Another positive thing about this mascara is, that it is really long-lasting. When I get my make-up off at night, the mascara hasn’t left any spots or black marks on my eyes which is fantastic as I don’t want to turn into a panda during the day. My other make-up may have faded a bit during the day, but not my mascara. A last thing I want to add is that this mascara doesn’t make my eyelashes hard or dry as I’ve had with other mascaras. They feel and look natural. This entry was posted in Beauty, Make-up and tagged beauty, make-up, mascara, rimmel. Today’s quote : a happy marriage. Klinkt goed! Ik heb ook heel snel droge wimpers, dan brokkelen ze een soort van af ofzo. Deze mascara moet ik maar eens proberen!